Modular building hire is a way for business owners to construct temporary and bespoke spaces for their business to operate from. By using a temporary building system, we can quickly and efficiently create areas that are needed without the hassle of waiting for new permanent buildings or committing to leased property that will be an unnecessary financial burden in the long term. 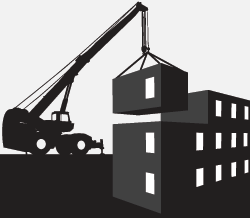 We have years of experience in temporary building hire and modular building leasing. We have the knowledge, experience and inventory to cover your business needs. Whether you are looking for portable office hire for extra space in a vital sprint for your company or you need portable building hire to free up more workshop space for your construction firm, we have you covered. You need to be able to keep up with demand, regardless of the type of business you are running. By using our service, we can give you the freedom and flexibility you need in terms of extra floor space for your company without tying yourself down. Building a permanent structure is a costly and time consuming process and renting extra floor space can be a real drain on resources if you only need a new building for a limited period. With temporary office buildings we can help you match your companies needs without committing to a long term and expensive solution. We offer competitively priced solutions for your office space needs. At 4More Space, we guarantee that your extra capacity will be provided on time and to the utmost standards. Not only can you find a whole range of new and used modular buildings within our portfolio, but we are also ready and waiting to help custom build you a solution that matches your exact demands.